Until the age of six or seven, children learn primarily by imitation, by seeing and doing. 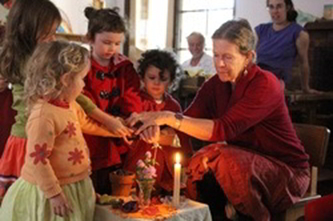 They are open to almost all influences in their environment and so the first priority of a Steiner School Kindergarten is to create a warm, loving, homey environment in which the children can feel completely secure. For more information about the Kindergarten curriculum, please refer to our Curriculum page. Children in Little Kindergarten attend five hours of kinder each week (one morning and one afternoon). Sessions are held on Tuesdays and Fridays. Children in Big Kinder attend 15 hours of kinder each week. Sessions are held on Mondays, Wednesdays and Thursdays. All sessions are held in our Kindergarten room at our Early Childhood Campus located at 51 School Road in Menzies Creek. To apply for a place in our Kindergarten Program, please complete an Enrolment Application Form and return it to our main office. Or please contact our Enrolment Officer at (03) 8790 4797 for more information.